The following words and terms when used in this chapter shall have the following meanings unless the context clearly indicates otherwise. All terms defined in Chapter 7 (§54.1-700 et seq.) of Title 54.1 of the Code of Virginia are incorporated in this chapter. "Credit hour" means a combination of the number of hours in class each week and the number of hours per week in a laboratory by which a school may measure its course work. One unit of credit equals one hour of classroom study, two hours of laboratory experience or three hours of internship or practicum or a combination of the three times the number of weeks in the term. Emerging delivery methodologies may necessitate a unit of undergraduate credit to be measured in nontime base methods. These courses shall use the demonstration of competency, proficiency or fulfillment of learning outcomes to ensure these courses are equivalent to traditionally delivered courses. 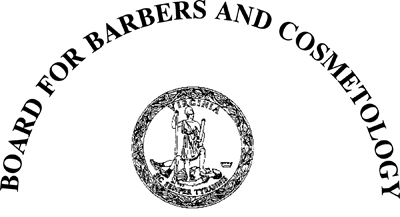 "Licensee" means any individual, partnership, association, limited liability company, or corporation holding a license issued by the Board for Barbers and Cosmetology as defined in §54.1-700 of the Code of Virginia. Historical Notes: Derived from Virginia Register Volume 23, Issue 25, eff. September 20, 2007. The applicant shall be in good standing as a licensed esthetician in every jurisdiction where licensed. The applicant shall disclose to the board at the time of application for licensure any disciplinary action taken in another jurisdiction in connection with the applicant's practice as an esthetician. The applicant shall disclose to the board at the time of application for licensure whether he has been previously licensed in Virginia as an esthetician or master esthetician. The applicant shall sign, as part of the application, a statement certifying that the applicant has read and understands the Virginia esthetics license laws and the board’s esthetics regulations. In accordance with §54.1-204 of the Code of Virginia, each applicant shall disclose a conviction, in any jurisdiction, of any misdemeanor or felony. Any plea of nolo contendere shall be considered a conviction for this purpose of this section. The record of a conviction certified or authenticated in such form as to be admissible in evidence under the laws of the jurisdiction where convicted shall be admissible as prima facie evidence of such guilt. The board, at its discretion, may deny licensure or certification to any applicant in accordance with §54.1-204 of the Code of Virginia. The applicant shall provide evidence satisfactory to the board that the applicant has passed the board- approved examination requirement administered either by the board or by independent examiners. Training outside of the Commonwealth of Virginia. Any person completing esthetics training that is substantially equivalent to the Virginia program but is outside of the Commonwealth of Virginia must submit to the board documentation of the successful completion of training to be eligible for examination. If less than the required hours of esthetics training was completed, an applicant must submit a certificate, diploma or other documentation acceptable to the board verifying the completion of a substantially equivalent esthetics course and documentation of six months of work experience as an esthetician in order to be eligible for the esthetician examination. Upon proper application to the board, any person currently licensed to practice as an esthetician in any other state or jurisdiction of the United States and who has completed both a training program and examination requirement that is substantially equivalent to that required by this chapter may be issued an esthetician license without an examination. The applicant must also meet the requirements set forth in 18VAC41-70-20 A. Applicants for initial licensure shall meet the examination requirement approved by the board. The examinations may be administered by the board or by a designated testing service. The board maintains discretion in determining the license requirements. The fee for examination or reexamination is subject to contracted charges to the board by an outside vendor. These contracts are competitively negotiated and bargained for in compliance with the Virginia Public Procurement Act (§2.2-4300 et seq. of the Code of Virginia). Fees may be adjusted and charged to the candidate in accordance with these contracts. The fee shall not exceed $225 per candidate. The examination shall be administered by the board or the designated testing service. The applicant shall follow all procedures established by the board with regard to conduct at the examination. Such procedures shall include any written instructions communicated prior to the examination date and any instructions communicated at the site, either written or oral, on the date of the examination. Failure to comply with all procedures established by the board and the testing service with regard to conduct at the examination may be grounds for denial of application. A temporary license to work under the direct supervision of a currently licensed esthetician or master esthetician may be issued only to applicants for initial licensure that the board finds eligible for the applicable examination. Any person continuing to practice esthetics services after a temporary license has expired may be prosecuted and fined by the Commonwealth under §54.1-111 A 1 of the Code of Virginia. 18 VAC 41-70-80. Spa license. Any individual wishing to operate an esthetics spa shall obtain a spa license in compliance with §54.1-704.1 of the Code of Virginia. An esthetics spa license shall not be transferable and shall bear the same name and address of the business. Any changes in the name, address, or ownership of the spa shall be reported to the board in writing within 30 days of such changes. New owners shall be responsible for reporting such changes in writing to the board within 30 days of the changes. In the event of a closing of an esthetics spa, the owner must notify the board in writing within 30 days of the closing, and return the license to the board. 18 VAC 41-70-90. School license. Any individual wishing to operate an esthetics school shall obtain a school license in compliance with §54.1-704.2 of the Code of Virginia. All instruction and training of estheticians shall be conducted under the direct supervision of a certified esthetics instructor. All instruction and training of master estheticians shall be conducted under the direct supervision of a certified master esthetics instructor. An esthetics school license shall not be transferable and shall bear the same name and address as the school. Any changes in the name or address of the school shall be reported to the board in writing within 30 days of such change. The name of the school must indicate that it is an educational institution. All signs or other advertisements must reflect the name as indicated on the license issued by the board and contain language indicating it is an educational institution. In the event of a change of ownership of a school, the new owners shall be responsible for reporting such changes in writing to the board within 30 days of the changes and obtain a new license. In the event of a school closing, the owner must notify the board in writing within 30 days of the closing, and return the license to the board. Completes an instructor training course approved by the Virginia Board for Barbers and Cosmetology under the supervision of a certified esthetics instructor or master esthetics instructor in an esthetics school and passes an examination in esthetics instruction administered by the board or by a testing service acting on behalf of the board. Persons who (i) make application for licensure between September 20, 2007, and September 19, 2008, and (ii) have completed one year of documented work experience as an esthetics instructor are not required to complete subdivision 2 of this subsection. Esthetics instructors shall be required to maintain a Virginia esthetician license. Persons who (i) make application for licensure between September 20, 2007, and September 19, 2008, and (ii) have completed one year of documented work experience as a master esthetics instructor are not required to complete subdivision 2 of this subsection. Master esthetics instructors shall be required to maintain a Virginia master esthetician license. Historical Notes: Derived from Virginia Register Volume 23, Issue 25, eff. September 20, 2007; amended, Virginia Register, Volume 27, Issue 23, eff. September 1, 2011; amended, Virginia Register, Volume 30, Issue 10, eff. March 1, 2014. All fees are nonrefundable and shall not be prorated. When a licensed individual or entity fails to renew its license within 30 days following its expiration date, the licensee shall apply for reinstatement of the license by submitting to the Department of Professional and Occupational Regulation a reinstatement application and renewal fee and reinstatement fee. When an esthetician or master esthetician fails to renew his license within two years following the expiration date, reinstatement is no longer possible. To resume practice, the former licensee shall apply for licensure as a new applicant, shall meet all current application requirements, and shall pass the board’s current examination. Individuals applying for licensure under this section shall be eligible to apply for a temporary license from the board under 18VAC41-70-70. When an esthetics spa fails to renew its license within two years following the expiration date, reinstatement is no longer possible. To resume practice, the former licensee shall apply for licensure as a new applicant and shall meet all current application requirements. The application for reinstatement for an esthetics school shall provide the reasons for failing to renew prior to the expiration date, and a notarized statement that all students currently enrolled or seeking to enroll at the school have been notified in writing that the school's license has expired. All of these materials shall be called the application package. Reinstatement will be considered by the board if the school consents to and satisfactorily passes an inspection of the school by the Department of Professional and Occupational Regulation and if the school’s records are maintained in accordance with 18VAC41-70-230 and 18VAC41-70-240. Upon receipt of the reinstatement fee, application package, and inspection results, the board may reinstate the school's license or require requalification or both. If the reinstatement application package and reinstatement fee are not received by the board within six months following the expiration date of the school's license, the board will notify the testing service that prospective graduates of the unlicensed school are not acceptable candidates for the examination. Such notification will be sent to the school and must be displayed in a conspicuous manner by the school in an area that is accessible to the public. No student shall be disqualified from taking the examination because the school was not licensed for a portion of the time the student attended if the school license is reinstated by the board. When an esthetics school fails to renew its license within two years following the expiration date, reinstatement is no longer possible. To resume practice the former licensee shall apply for licensure as a new applicant and shall meet all current application requirements. A licensee who reinstates his license shall be regarded as having been continuously licensed without interruption. Therefore, a licensee shall be subject to the authority of the board for activities performed prior to reinstatement. A licensee who fails to reinstate his license shall be regarded as unlicensed from the expiration date of the license forward. Nothing in this chapter shall divest the board of its authority to discipline a licensee for a violation of the law or regulations during the period of time for which the individual was licensed. 18 VAC 41-70-170. Applicants for school license. Any person, firm, or corporation desiring to operate an esthetics school shall submit an application to the board at least 60 days prior to the date for which approval is sought. Submit its curricula for board approval. Esthetician curricula shall be based on a minimum of 600 clock or equivalent credit hours and shall include performances in accordance with 18VAC41-70-190. Master esthetician curricula shall be based on a minimum of 600 clock or equivalent credit hours and shall include performances in accordance with 18VAC41-70-190 C.
Complete practical instruction in the school’s clinic area. aa. General procedures and safety measures for trichloracetic acid peels; and bb. Pretreatment and posttreatment for trichloracetic acid peels. A licensed esthetics school with an approved esthetics program may conduct an assessment of a student’s competence in esthetics and, based on the assessment, give a maximum of 300 hours credit towards the requirements specified in subsection B of this section and 18VAC41-70-200 A. A licensed esthetics school with an approved master esthetics program may conduct an assessment of a student’s competence in master esthetics and, based on the assessment, give a maximum of 300 hours credit towards the requirements specified in subsection C of this section and 18VAC41-70-200 B. The school shall make the assessment based on a review of the student’s transcript and the successful completion of a board-approved competency examination administered by the school. The school may also request a copy of a catalog or bulletin giving the full course description when making the evaluation. The number of credit hours awarded shall not exceed the actual hours of instruction verified on the transcript or the number of hours specified in the board-approved curriculum for a specific topic. 18 VAC 41-70-220. School identification. Each esthetics school approved by the board shall identify itself to the public as a teaching institution. Schools are required to keep all records of hours in accordance with 18VAC41-70-190, including transcripts, course descriptions and competency examinations used to award such credit for a period of five years after the student terminates or completes the curriculum of the school. Schools are required to keep upon graduation, termination or withdrawal written records of hours and performances showing what instruction a student has received for a period of five years after the student terminates or completes the curriculum of the school. These records shall be available for inspection by the department. All records must be kept on the premises of each school. For a period of five years after a student completes the curriculum, terminates or withdraws from the school, schools are required to provide documentation of hours and performances completed by a student upon receipt of a written request from the student. Prior to a school changing ownership or a school closing, the schools are required to provide to current students documentation of hours and performances completed. For a period of one year after a school changes ownership, schools are required to provide documentation of hours and performances completed by a current student upon receipt of a written request from the student. 18 VAC 41-70-240. Hours reported. Within 30 days of the closing of a licensed esthetics school for any reason, the school shall provide a written report to the board on performances and hours of each of its students who have not completed the program. Each licensed spa or school shall ensure that all current licenses and temporary licenses issued by the board shall be displayed in the reception area of the spa or school in plain view of the public. Duplicate licenses or temporary licenses shall be posted in a like manner in every spa or school location where the regulant provides services. Compliance with these rules does not confer compliance with other requirements set forth by federal, state and local laws, codes, ordinances, and regulations as they apply to business operation, physical construction and maintenance, safety, and public health. Electrical appliances and equipment shall be in safe working order at all times. Chemicals that could interact in a hazardous manner (oxidizers, catalysts and solvents) shall be separated in storage. In addition to any requirements set forth in this section, all licensees and temporary license holders shall adhere to regulations and guidelines established by the Virginia Department of Health and the Occupational and Safety Division of the Virginia Department of Labor and Industry. All spas and schools shall immediately report the results of any inspection of the spa or school by the Virginia Department of Health as required by §54.1-705 of the Code of Virginia. 18 VAC 41-70-280. Grounds for license revocation, probation, or suspension; denial of application, renewal or reinstatement; or imposition of a monetary penalty. The licensee, certificate holder, or temporary license holder fails to teach in accordance with the board- approved curriculum or fails to comply with 18VAC41-70-190 D when making an assessment of credit hours awarded. The licensee, certificate holder, temporary license holder, or applicant fails to notify the board in writing within 30 days that the licensee, certificate holder, temporary license holder, or applicant has pleaded guilty or nolo contendere or was convicted and found guilty of any misdemeanor or felony. The instructor, owner or director is guilty of fraud or deceit in the teaching of esthetics. The owner or operator allows a person who has not obtained a license or a temporary license to practice as an esthetician or master esthetician. In addition to subsection A of this section, the board may, in considering the totality of the circumstances, revoke, suspend, place on probation, or refuse to renew or reinstate the license of any licensee or impose a fine as permitted by law, or both, if the board finds that the licensee fails to take sufficient measures to prevent transmission of communicable or infectious diseases or fails to comply with any local, state or federal law or regulation governing the standards of health and sanitation for the practice of esthetics.